Does Losing Weight Affect Your Gum Disease? Being overweight can lead to many health issues - heart disease, high blood pressure, diabetes. Losing weight, through a healthy diet and exercise, can greatly decrease your risk for these issues. And now, research shows that your weight can play a role in the development of gum disease. 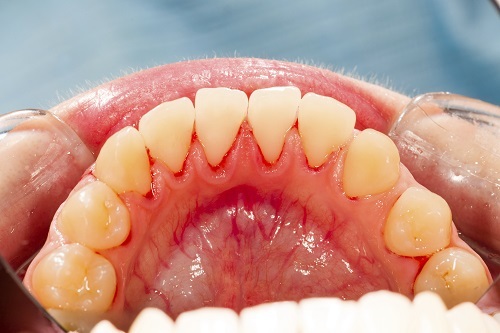 Gum disease is an infection that affects the health of your gums and teeth. It starts off almost unnoticeable, with red, inflamed and bleeding that happens following brushing and flossing. Untreated, it progresses to cause your gums to recede, making your teeth more susceptible to decay. The infection can then spread into the roots of your teeth and your jawbone, leading to tooth loss. Infection can even spread into the bloodstream and travel throughout the body, leading to other health issues, such as heart disease and stroke. Overweight individuals are at an increased risk of suffering inflammatory diseases, under which gum disease falls. Studies have shown that those who are overweight are twice as likely as those who are not to suffer gum disease while those who are obese are three times as likely. This is because these individuals have more fat cells, which increase inflammation. Inflammation inhibits blood flow, which means that less oxygen and less nutrients make their way to the gums. Physical activity, and weight loss, increases blood flow. A healthy diet, one which contains all of the necessary nutrients - including vitamin C, vitamin A, and calcium among many others - for healthy gums and teeth is crucial. Diet for weight loss also includes low fat, low sodium foods, as well as an abundance of fruits and vegetables. Weight loss decreases the amount of fat cells in your body as well, which decreases the amount of inflammation in your body. Losing weight can greatly decrease your likelihood of developing gum disease and help prevent gum existing gum disease from worsening. But it is not the key. Proper oral hygiene and regular dental visits are crucial to saving your gums and teeth from suffering this devastating disease. Please contact our office if you have any questions about gum disease.